Figures just published show an increased take-up of office space on Newcastle’s perimeter. Naylors Chartered surveyors have just published figures showing an increased take-up of out-of-town office space. While only 33,461 sq ft of space was taken up in Newcastle city centre in the first quarter of 2017, the office take-up outside of the town centre shows a healthy growth at 177,041 sq ft in the first quarter of 2017. Fenham Hall Studios owner Peter Lambert said: “ The move to avoid city congestion and benefit from lower rents has I believe encouraged more businesses to look at locations on the city fringe. This doesnt always mean losing out on facilities either. Many peripheral developments are close to local shops and lunchtime facilities. On site car parking and visitor parking is also a factor many out-of-town developments provide better parking than their city centre counterparts. Access to the main road routes North and South and to Newcastle Airport are also a factor and office developments which offer this without getting snarled up in City Centre traffic, especially during rush hour, are increasingly attractive to businesses”. 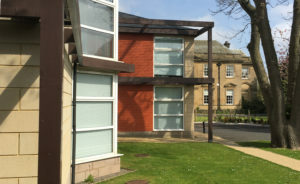 Fenham Hall Studios offers modern office space in the grounds of a grade 2 star listed building, Fenham Hall, built in 1745 for the John Ord a former Mayor of Newcastle. Fenham Hall Studios is a secure development with dedicated parking and visitor parking close within 8 minutes of the City centre, with a regular bus service to the centre and nearby shops and lunch facilities. Mature trees including Yew planted around the time of the original Hall in the 18th century and beautifully maintained gardens offer a calm and tranquil environment with dedicated on-site parking and visitor parking. The offices have high speed internet are fully carpeted, have CAT 2 lighting in suspended ceilings.